Ah, and so this is Christmas. So much in-your-face commercial crap, and a lot of pressure to have a perfect event. Like every year, I have kept my commitment to avoid shopping malls, over indulgence and unnecessary expense. And yet, in my struggle to identify meaning, I always find there is something unexpected there and take joy in passing on traditions to my sons. Cookies. Despite the warmer weather, this year we still baked lots of biscuits. I timed the cooking to coincide with brief cold spells that served to remind that the warmer weather is slower to arrive in Canberra. 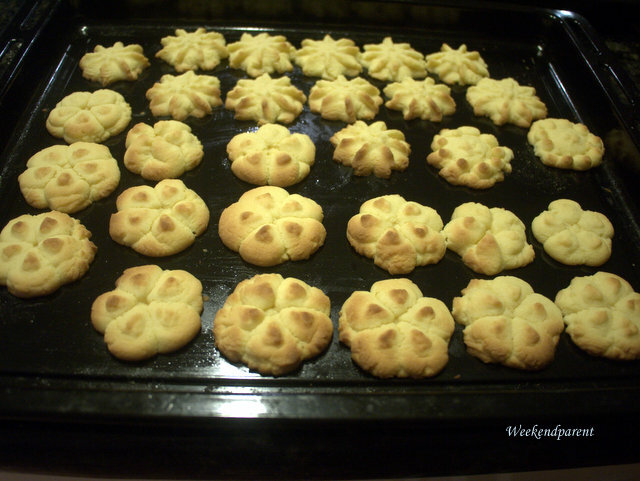 I rediscovered an old cookie press, and we made lots of butter spritz biscuits. These were a bit quicker than cutting and icing cookies (although we did that as well). The technique is still a bit hard for my boys, but perhaps by next year Big A can have a go as well. He certainly enjoyed trying, and selecting the right shapes. Cards. I love all those Christmas cards in the mail, and especially the online Jacqui Lawson e-cards. I don’t receive so many these days, perhaps because I don’t write as many. But I do make a conscious effort to pause and remember with gratitude those who have made a positive impact on my life throughout the year. Colours. The colours of a Christmas in Australia are different to the northern hemisphere. Red and green are important, but so too are white and my favourite colour of purple. I love the bright purple and white Agapanthus that come out every year in my neighbour’s garden adjoining our driveway. They are also known as ‘Star of Bethlehem’, and to me their coming always heralds Christmas. My home is also resplendent with huge rows of purple and pink hydrangeas – we also had a hedge growing in my home when I grew up, so the sight of them in flower is nostalgic. And it is hard to beat flowering lavender, often at its best just before and after Christmas. Community. Christmas is a time for catching up with people. Although I didn’t quite do the rounds of Christmas parties to the same extent as I did pre-children, it was still a time for catching up with my local community, whether it is with work mates, play groups or your neighbours. It such a social time in Australia: there is always something on. Charity. Christmas is a season for giving, and this year I was privileged to participate (in a small way) in the Kippax Uniting Church’s hamper program. In addition, my sister, father and I all donated to the Kippax Uniting Church’s ‘Let’s Give Everyone A Christmas’ campaign rather than buying each other tacky Christmas presents. We get less unwanted clutter, and we feel good about helping people who have little. Christmas tree. There is something so special about the scent of a real pine Christmas tree. We are spending Christmas with my Dad, and my boys had so much fun choosing a Christmas tree with Grandpa, and driving home with the tree on top of the car. Craft. Pride of place on the tree are homemade ornaments and decorations, made with cardboard, pipe cleaners and glitter at the kids’ childcare centre and at an advent craft workshop at the Kippax Uniting Church. They might not be perfect, but they warm my heart more than any delicate European blown glass bauble every could. Cherries. What would any Australian Christmas be without cherries? This year the season has been especially good, lasting right up until Christmas. Little A, only two and a half, has already worked out how to eat around them to remove the ‘stone’. He makes an awful mess of cherry juices, which I guess is half of the fun. Children. There is something magical about watching my children experience Christmas. They get so excited at the simplest things: lights on Christmas trees, Santa arriving to give them presents at their childcare centre, leaving chocolates and milk out for Santa, waking up early on Christmas morning to rip open their presents. I disagree in principle with many of the Santa traditions (e.g. paying for them to sit on Santa’s lap — stranger danger, hello! ), but somehow I can’t help but continue to propagate the Santa story. Clement C. Moore — ‘Twas the Night Before Christmas. My mother used to read this to my sister and I on Christmas Eve, and we still can remember the poem word for word. My kids are too young to entirely appreciate it, but perhaps one day they will fully get into it. My sister recently discovered the original book: it is a bit tattered and worn, but to me is so priceless. Crayfish. 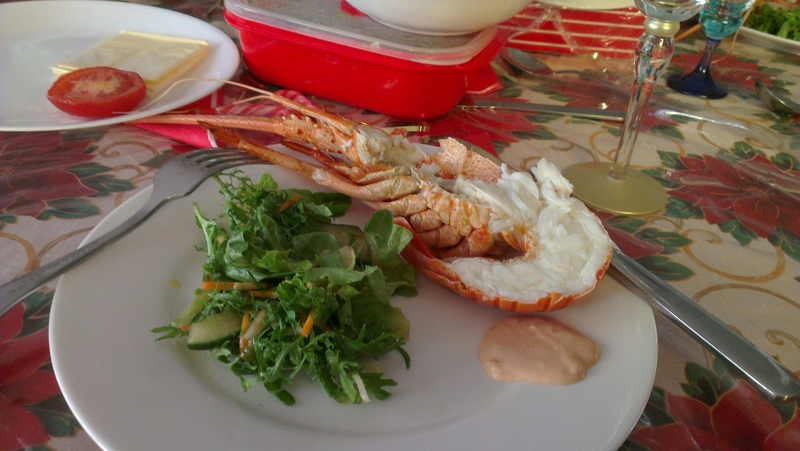 I am bragging here, but after enjoying turkey and pavlova for lunch, we just had a ‘light’ supper of crayfish and prawns — with a glass of bubbly. Australian seafood is the best, and the warm summer weather is so conducive to enjoying the bounty of produce from the sea. Merry Christmas from me and the kiddies, who have enjoyed a great season of abundant Christmas cheer. I hope you are having an enjoyable festival, and that you are cherishing the central tenants of peace, love and goodwill to all people.